Copy Plus has been providing factory trained copier service to hundreds of businesses in the greater Houston area since 1995. Our Technicians service and repair copiers, fax machines, and printers. We service all makes and models of fax machines and printers from HP, Brother, and Sharp, along with other major leading brands. 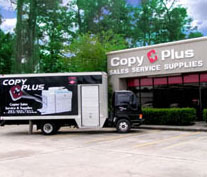 Copy Plus specializes in leasing, selling, and servicing high quality remanufactured Canon copiers and fax machines. This allows our customers to have equipment in their office that is truly "like new" in both quality and appearance. This assures a cost effective solution with savings as much as 65% of the original price. One of our specialties is late model Canon digital copiers that range from 15-85 copies per minute. Many of the machines can be configured with fax, print, and scan. Copy Plus also sells new equipment and our factory trained technicians are qualified to service all other major leading brands. Our philosophy, "servicing you with integrity", assures our customers of our commitment to meet their office needs. Call 713-829-1505 or contact us online for more information about our copier, printer, and fax repair services. Serving the Houston area of Texas, including Woodlands, Spring, Conroe, Huntsville, and all surrounding communities. Copy Plus on Yahoo Local • Copyright © 2011. Copy Plus. All rights reserved.